'Retro was never dies' is an ideal expression for the birth of 2017 Yamaha SCR950. The figure of an 'old young heart' motorcycle has become the latest weapon from Yamaha to block the Ducati and Triumph that have already launched several models of scrambler motorcycles. New Yamaha SCR950 taken from the base of Yamaha Star Bolt C-Spec which was born as a cruiser. Despite wearing the same chassis, but Yamaha alter some sectors to match the manly impression of scrambler style. The first, Yamaha widen the wheelbase and narrow the angle of inclination. The front wheels remain the same which uses 19-inches size, but the rear wheel is also made larger by wearing a 17-inches size from the previous 16-inches. As a result, the seat height increased by about 5 inches to 32.7-inches, which makes a more upright riding position. Also increases the overall weight of about 5 lbs of standard version of Bolt C-Spec. No change in the driving sectors, meaning that its drivetrain still carrying the 942 cc air-cooled V-Twin engine that is also used by Bolt C-Spec. For transfering the engine power, it using the 5-speed transmission system with belt. 2017 Yamaha SCR950 can be ordered in the United States started on July 2016. There are two colors available, Charcoal Silver and Rapid Red. 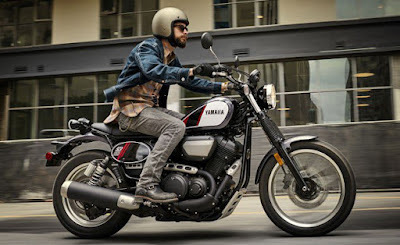 The Yamaha scrambler motorbike was sold at a price tag of US. $8,699 or about Rp.116 million.